I thought it was about time for a another FREE pattern sewists! And it is Easter, the weather is getting warmer and I am desperate to get into something a bit lighter and prettier. This feminine top is an adaptation of my very popular 2 Hour Top. The Ruffle Top pattern has raglan sleeves, a demure 1960s-style high neckline and pretty ruffles on the raglan seam. You don’t have to add the ruffles but it gives it a contemporary look which I like. I have also added some darts at the bust for a slightly more fitted shape than the original pattern. 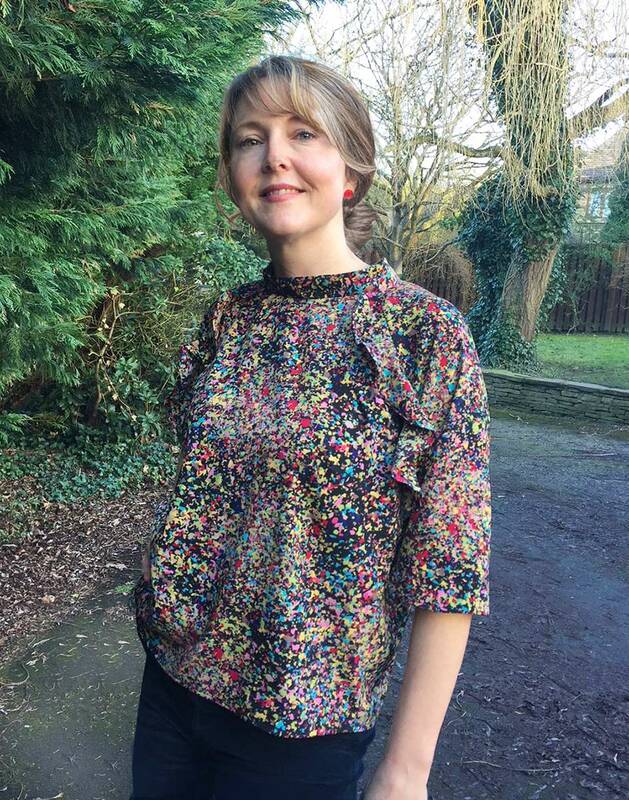 I’ve made my Easter version here in a really beautiful fabric from Fabworks called the Jackson Pollock Crepe de Chine. 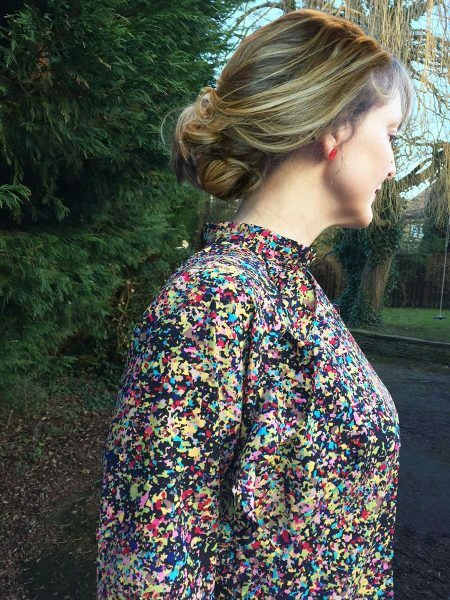 I couldn’t believe how cheap this fabric was – only £8/m. It looks so much like a Nani Iro or Atelier Brunette design but is about a third of the price of these lovely brands. I did check as I was buying it and there is limited stock, but it is still available online. 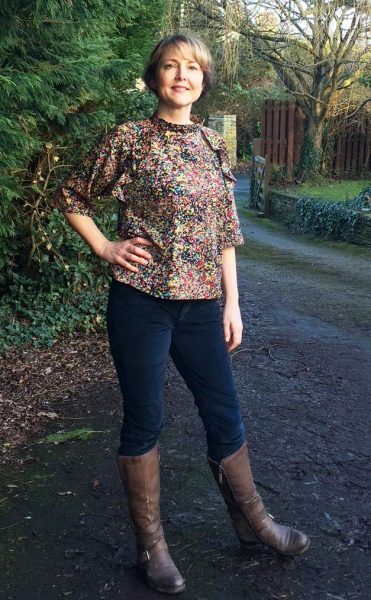 The Ruffle Top comes in a UK size 12 and has 1.5cm seam allowance. It takes 1.25m of fabric and works best in a fabric with a good drape to it. I think the ruffles would be a little bit stiff if you used 100% cotton. Something like a viscose or a crepe, or even a lightweight jersey would work well. You can download the pattern and print at home. • Sew the 2 BACK pieces together leaving an opening at the top where it is marked. Press your seams open. Edge finish and top stitch around the opening. • Hem the longer edge of each SLEEVE RUFFLE (marked in pink) with a small roll hem. This is quite tricky to do on a curve – you just have to take it slowly. Alternatively you can just edge finish them with an overlocker if you don’t mind this more raw look. • Tack the raw edge of each of the SLEEVE RUFFLES to each of the front edges of the SLEEVE with the pointed end closest to the neckline, and making sure that this stitching is just inside your 1.5cm seam allowance. • Sew the front edge of the each SLEEVE to the front edges of the FRONT making sure that your ruffles are lying flat. • Sew the back edges of the SLEEVE to the BACK. 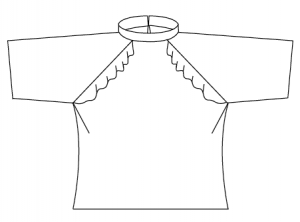 • Fold the COLLAR in half along its length with right sides together and sew up one end. Turn it the other way out and press. With right sides together and starting at the centre back, pin the COLLAR to the neckline all the way round. Sew up the other end to align exactly with the back opening (you can add in a button loop at this point if you want to) and stitch the collar in place. Trim the seam allowance to allow it to sit properly. 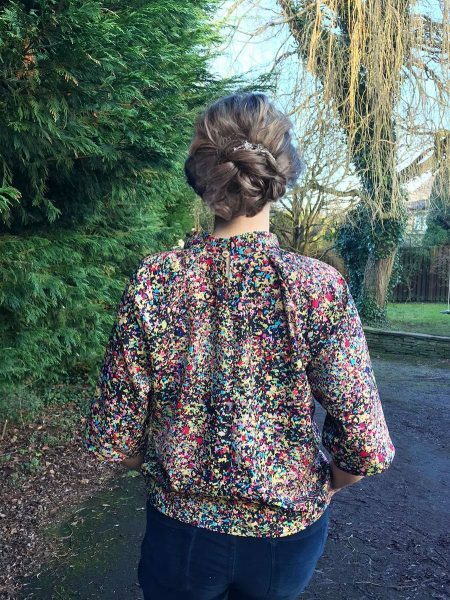 • Add a small popper or button at the back of the collar – and you are finished!